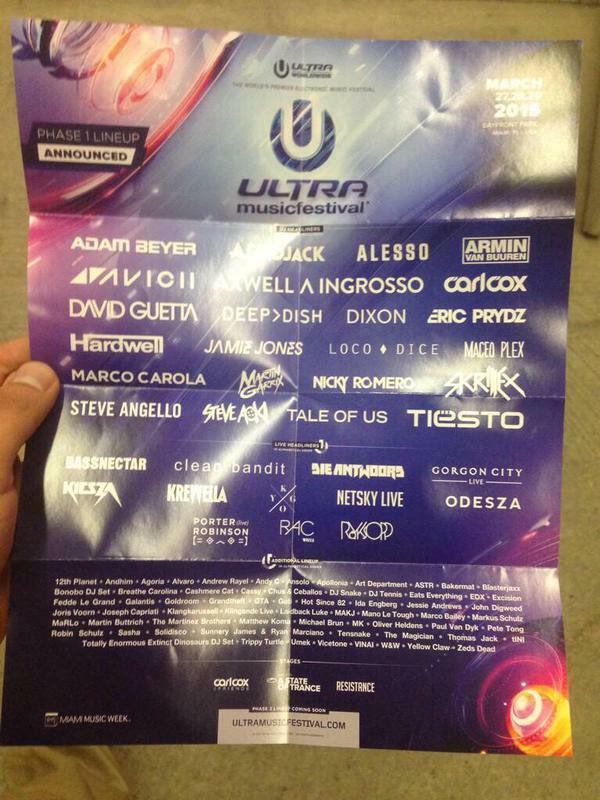 The first phase of Ultra Music Festival’s 2015 lineup has been revealed. The Miami-based EDM festival will take place at Bayfront Park during the weekend of March 27th and 29th. The initial lineup features heavyweights like Skrillex, Avicii, Tiësto, Armin Van Buuren, David Guetta, Afrojack, Bassnectar, Carl Cox, Steve Aoki, Sebastian Ingrosso, Alesso, Netsky, Deep > Dish, Steve Angello, Porter Robinson, Kiesza, and Loco Dice. Other notable acts include Die Antwoord, Röyksopp, Zeds Dead, 12th Planet, Gorgon City, Pete Tong, Fedde Le Grand, Martin Buttrich, Paul Van Dyk, RAC, Loco Dice, Jamie Jones, Markus Schulz, Nicky Romero, Art Department, ASTR, Bonobo, DJ Snake, and Eats Everything. General admission tickets ($449.95) and VIP passes ($1,149.95) are now available through the festival’s website. This year’s edition of Ultra almost didn’t take place after Miami officials threatened to ban the event following a series of tragic events, including the death of a 21-year-old man from a drug overdose. In response, Ultra officials agreed to implement an 18-and-older age limit and new drug policy.